Innovation begets progress. Sometimes, on the way to progress, however, innovation begets frustration. So it was with Estey’s Luminous console, the storied “cash register” console, built in Brattleboro, Vermont during the 1920s. The number of organists today who have experienced one of these organs is few and growing fewer, as are organ builders who have maintained or rebuilt them. 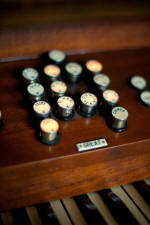 The Estey Organ Company was an industrial phenomenon in the late nineteenth- and early twentieth centuries. During those years of industrial growth and a blooming middle class, the company churned out an astounding one-half million reed organs, ranging from little parlor pump organs to serious, large church organs with many ranks of reeds. On the way, Estey set new standards for humane industrial relations, including paying women and men equally for the same work, a novel and controversial policy at the time. Dennis Waring has documented the remarkable history of Estey, with particular emphasis on the reed organ business, in his 2002 book, Manufacturing the Muse: Estey Organs and Consumer Culture in Victorian America. 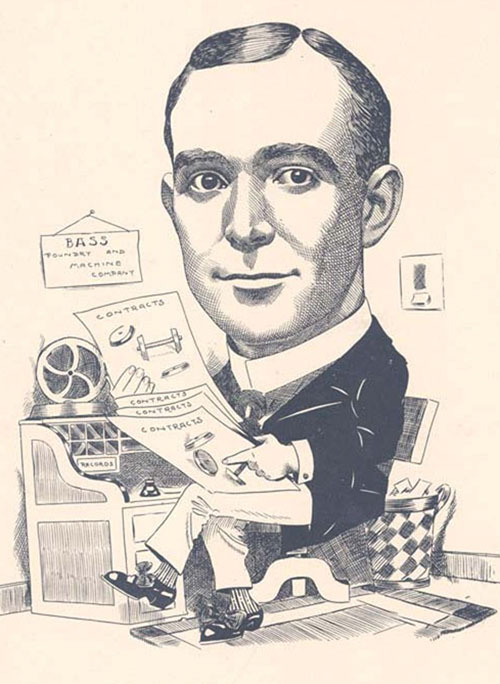 We still remember William E. Haskell as the inventor of the “Haskell bass”. An open pipe with this treatment is a bit longer than half its actual speaking length, with a compensating tube either inside or outside the pipe. Haskell bases are still made today, and are often used to allow a long pipe to be placed under a low ceiling. Sadly, very few modern builders experiment with the unique tonal possibilities of these pipes. Estey used this method, which they called the “patent bass,” extensively. Haskell basses are often found in Estey’s string stops, but also in flutes, diapasons, or even reeds. Haskell pipes were easier to install and more elegant than long miters that could break or tip pipes out of their toe holes. William Haskell also developed a whole class of labial, or “reedless,” reeds. Those organists who have had experience with the ubiquitous Möller Oboe Gambe might be tempted to misjudge this class of stop. In fact, Estey built fine imitative reedless stops. They were developed for the early tubular pneumatic organs that were often installed in rural locales where tuning visits were rare and heat in the churches was uneven at best. They provided a very acceptable imitation of the reed sound, and they stayed in tune. Estey was never satisfied with conventional methods of stop control, and continually sought ways to make the console more manageable. Many of their tubular pneumatic organs had the stop controls grouped in the form of a small additional keyboard above the top manual. Each key had a stop name engraved on its front. When the key was depressed, it locked in place and the stop was on. Pressing the adjacent black key returned the stop to the off position. The system was a Haskell invention. Although Estey built many large electropneumatic organs with standard stopkey or drawknob controls, they are best remembered for the “Luminous” console – forever nicknamed the “Cash Register” console. The name comes from the appearance of the buttons, which look like the keys on an old cash register, and because one of the first consoles of this design was built in 1922 for the four manual Estey organ in the auditorium of the National Cash Register Company in Dayton. Estey applied for a patent on the Haskell-designed Luminous console system in 1923. By the time the patent was finally granted in 1929, William Haskell was dead, and the Luminous console had been abandoned. 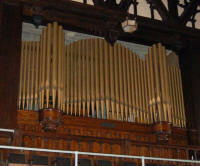 During the years 1922-1928, however, Estey built dozens of these organs for churches, homes, auditoriums, and theaters. Had the inventor’s health not failed in 1924, leading to his death three years later, he might have had time to correct some of the shortcomings of his invention. Sadly, though, the pressures of intense competition, Estey’s growing financial woes, and the coming of the Great Depression combined to eliminate any chance that this innovative product would be perfected. My first experience with Estey and the Luminous console was in 1975, when I rebuilt my first organ, a three manual Estey (Opus 2727, 1928) of twenty-eight ranks in a high school gymnasium. The organ had been abandoned many years before, and the rebuilding process necessarily included figuring out how it worked. A college student at the time, I wrote about the project in a July, 1976 article that appeared in Music magazine. That organ played for nearly thirty more years (on original leather), and still exists, although the building in which it is located has since been renovated and repurposed. Hopefully, the day will come when we will be able to restore it once more. Those of us who have grown up with lighted buttons all around us might have difficulty understanding how modern and “uber-cool” such an organ looked to a generation still accustomed to tracker and tubular pneumatic organs. 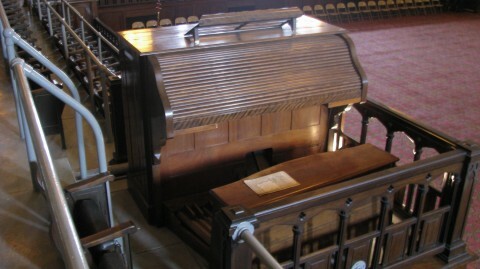 Organ builders were constantly inventing new ways to apply the wonders of electricity and motorized blowers to the organ, and organists and listeners alike were delighted with the big smooth sounds made possible by higher wind pressures, and with freedom from the stiff, clunky trackers of the past. (To readers leaping to their feet to defend the nineteenth century American trackers: I love them, too, but, face it, they WERE clunky.) Still, acceptance of the Luminous system was far from universal among players. A famous story that circulated about these consoles has to do with the matrix of lights formed by the stop buttons on a large organ. Supposedly, an organist or service man left the general combinations set so that each combination spelled out a different dirty word. I have heard versions of this story starring several famous organists and several notable organs. My guess is that it actually happened, not once, but frequently. The stops were usually clustered by division, and then lined up according to tone family. The bottom row of buttons usually controlled strings, the next flutes, then diapasons, and finally reeds. Left to right, the stops were in order of pitch and intensity. Couplers were located in the upper right hand corner of each division. It was possible with this system to draw large groups of stops quickly, and, since the same motion brought stops on or off, the player could benefit from economy of motion. Even on a very large organ, the stops were arranged compactly, all within easy reach of the performer. The concept was the exact opposite of the currently popular Cavaillé-Coll-style terraced horseshoe console, in which every stop is in a different plane and at a different distance from the performer, some barely reachable. The poet Robert Browning wrote “Ah, but our reach should exceed our grasp, else what’s a heaven for?” It is a sentiment that could easily apply to Estey’s Luminous console. Their reach clearly exceeded their grasp. Or, said differently, their concept exceeded their technology. The consoles were difficult to maintain, and very frustrating when they misbehaved. And they constantly misbehaved! For the Estey firm, they were a miserable financial drain and embarrassment. By the end of 1928, the company had abandoned the design in favor of more conventional methods of stop control. After rebuilding “my” Luminous console on the municipal organ in Marion, IN, I played it for many years for a variety of events, including the community’s large Easter Pageant. I found that the console system was very workable, what we would now call “user-friendly.” During the renovation process, I was able to make several small improvements, such as soldering all the connection points, that greatly improved the Luminous console’s performance. Over the next several years, we hosted a number of programs and concerts by Dennis James, Fred Binckes, Don Hustad, and others. The organ performed superbly during all these events. The console and combination action were fast and dependable. The biggest problem with these consoles was the button units themselves. The housings were Bakelite plastic. The buttons were made of nickel-plated brass tubing. A round celluloid disk carrying the name of the stop was crimped into the end of each brass tube, with a clear celluloid covering to protect the button and, as we shall see, the performer. Inside, the indicator light was a simple flashlight bulb. There were two phosphor-bronze contacts, and a return spring. Each unit was set into the solid mahogany nameboard. What could be simpler? What could possible go wrong with such an elegant design? The first problem organists encountered with this system was the natural tendency of light bulbs (in those dark days before the light-emitting diode) to eventually burn out. In part, this happened because of vibration when the buttons were pushed, and because the organ’s generator could cause erratic voltage spikes. When the lights started burning out, it would be anybody’s guess which stops were on and which were not. Of course, organists still experience this today on certain electronic organs that use lighted controls. Estey used 12 volt bulbs with the 10 volt generators in an attempt to lengthen bulb life. This, of course, had the effect of dimming the brightness of the little lights. This wasn’t a problem in a dark theater or a dimly lit church, but under bright lights it could be very difficult to tell if a button was lighted or not. Those little coverings were more than decorative. They insulated the player’s fingers from the electrical activity in the button. The edge of the button was formed from the same brass tube that completed the circuit between the button’s contacts. It was only a tiny current at low voltage, not even noticeable most of the time. But if your fingers were damp from playing the Guilmant or that stirring arrangement of War March of the Priests, pressing the buttons could impart a shock. Not enough of a shock to be dangerous, but enough to rattle the nerves, and perhaps to disturb the tempo! A nasty letter to the company in Brattleboro sometimes ensued. Theater organs were profit centers for their owners, and the managers usually lacked sympathy, a sense of humor, or a generous Christian attitude toward embarrassing problems with the organ! In about 1926, Estey redesigned the button units to reduce their travel. This made them more comfortable to use, but did not eliminate the other more critical problems. There were also issues having to do with the factory-made main cables in the organ that were intended to reduce installation time on site. Connecting and soldering the thousands of connections in a new organ was a long and laborious process. Then, as now, wasted site-time could quickly drain away the tiny profit margin on a new instrument. Estey’s cables snapped neatly onto little phosphor-bronze spring clips in the console and on each component throughout the organ. Over time, the connection points became dirty and oxidized, introducing resistance that led to dead notes and even dimmer lights. Organists who regularly played Luminous organs developed a habit of shielding the stop controls with their free hand (that would be the hand that wasn’t playing the keys or pushing the buttons), so they could see which stops were on. I have encountered other Luminous consoles over thirty-five years spent building and servicing pipe organs. In most cases, the consoles had been modified to replace the lighted buttons with more conventional stop control systems. This is sad, but certainly understandable. Today, only a handful of Luminous consoles with their lighted buttons are still in use. Then recently, Ed Snyder, representing the Masonic Temple in Fort Wayne, Indiana contacted me. 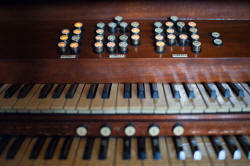 The temple has a pristine Estey organ with its original Luminous console system intact. This little organ (II manuals/16 ranks), an instrument that has been both the victim and the beneficiary of benign neglect, has an interesting history all its own. Fort Wayne is a city with a strong pipe organ tradition. When Opus 2525 was built by Estey in 1926 for the Masonic Temple, there were already two four-manual Luminous Esteys in the city, at Plymouth Congregational Church (1924) and at First Presbyterian Church (1925). Both organs are now gone, victims of age, changes in taste, and of console malfunctions. The organ in the Masonic Temple in Fort Wayne was given by Laura H. Bass, in memory of her husband, John H. Bass. Mr. Bass was a 33rd degree Mason, and a member of the Scottish Rite. The Masonic Temple organ was actually the second Estey pipe organ Mrs. Bass had given. In 1925, she had given the large 4-manual Estey (#2329) in First Presbyterian Church, where she and Mr. Bass were members. This was a very important instrument, and was well-known and respected at the time. Although Mrs. Bass gave the money for these pipe organs, the actual negotiations were handled by her son-in-law, Dr. Gaylord M. Leslie. Dr. Leslie started his association with the Bass family as a physician, eventually married Bass’s daughter, and finally left the practice of medicine to help manage the family’s business interests. He continued in this capacity after John Bass’s death. Dr. Leslie was an organist, and was clearly well-informed about organ design trends of the time, as we will see. He was also a tough and uncompromising businessman and an involved and dedicated Mason. In the negotiations, Estey was represented by A. R. Dolbeer, a legendary salesman who sold many Estey organs over a long career. Smaller organs of the time were usually based on generic stoplists that could be changed and adapted to a customer’s needs. At least one tonal aspect of the Masonic Temple organ turned out to be completely unacceptable to Dr. Leslie. In an effort to save space and to build an instrument that would be profitable in the extremely competitive organ market of the time, Estey began in about 1924 to experiment with unification in some of its smaller instruments. While some unification can be useful in a small organ, Estey and others, following the example of the theater organ, carried the practice to what Dr. Leslie considered to be an absurd extreme. The Masonic Temple organ was originally built with a single set of pipes to provide most of the flute sounds in the organ. In the Swell, this small stopped Bourdon (described fetchingly as an “augmented flute” by Estey) provided stops pitched at 16’, 8’, 4’, 2 2/3’, and 2’, as well as being used in the Great at 4’ and 2’. Dr. Leslie argued with Dolbeer that the unified flute would not provide sufficient power or variety for the organ in such a large space. The Swell Bourdon is supposed to be a very soft 16’ stop, the bass of which can be used as a suitable Pedal stop for the softestest (sic) Aeoline voiced. In order to have this Swell Bourdon (serve as) a suitable Pedal stop for an Aeoline, it has got to be voiced at nearly a whisper. If they want a heavier Bourdon stop, they have got a heavy Bourdon Pedal on the organ and we know that a Swell 16’ stop, if voiced too heavy, will muddy the whole Swell organ up. In addition, Estey had planned to use the lighter weight and more compact Deagan class “K” tubular chimes in the organ. Dr. Leslie firmly told Dolbeer that he would not accept these cheaper chimes, and insisted on Class “A” chimes. The contract cost of the organ was $7,970.50. Installation was completed in late September, 1926, with the better chimes, but still including the “augmented flute”. Then began several months of wrangling, as Dr. Leslie refused to accept the final product as built. It was clear that Dr. Leslie had been correct about the Bourdon stop in the Swell division. It was nearly inaudible from the opposite end of the room. Overall, Dr. Leslie felt that the organ lacked, in his words, “a certain amount of punch and pep.” In an attempt to mollify Leslie (without incurring any expense to itself) Estey made the decision to replace the original 2 hp blower with a 3 hp unit so the pressure could be raised from 5” to 6-1/4”, increasing the volume of the pipes. Another problem plagued the new organ. The relay required to operate the unit flute pipes was undependable because of problems with the electromagnets that were used to trigger the notes. Interoffice memoranda of Estey management indicate that the company was aware of this problem. Their solution was to raise the voltage on the entire organ by installing a larger drive pulley on the generator. Dr. Leslie would not accept this fix, and insisted on a new, properly sized generator. 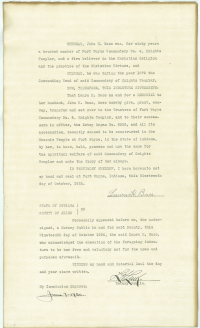 Finally, in March, 1927, Estey acceded to Dr. Leslie’s demands. One suspects from reading company documents that Dr. Leslie simply wore the home office down. And, of course, he was prominent as a Mason, and as a Presbyterian! A new 8’ Stopped Diapason, “which is the same scale that is on the present Presbyterian Church organ,” as well as a 4’ Flute d’Amour and a 2’ Piccolo, were added to the Masonic Hall instrument. The original Bourdon stop that had been the source of the dispute was demoted to become the soft Pedal 16’ Bourdon. The offending relay was also replaced. The cost of these improvements was $850, but it is not clear whether the Masons were ever charged. At the Masonic Temple, my own efforts thus far have been concentrated on getting the Luminous stop system working again, while other volunteers have cleaned the blower room and tuned the pipes. For me, it has been a walk down a very dusty memory lane. Even after all these years, and dozens of projects using state-of-the-art modern technology, it’s amazing how the things we learned in our youth – the hard way – come back to us. Getting to know this old organ has been a true joy! Although the old Estey has been coaxed back to life, and sounds remarkably good, a full restoration is urgently needed - and soon - if the instrument is to continue to function. Many options have been discussed, but clearly the best course is to restore #2525 to its original form and function. In the process, we can correct many of the problems that plagued the Luminous system, leaving it a dependable and functional example of the work of one of America’s most important – and inventive – organ companies. In the hallway of the fifth floor of Fort Wayne’s Masonic Temple hangs a large photograph of Dr. Gaylord Leslie. The route to the organ console passes directly in front this portrait. Dr. Leslie’s face has a very slight smile, not posed, but authentic. I hope the smile means that he approves of our efforts to save his instrument. Thad Reynolds is President and Tonal Director of Reynolds Associates, Inc., Pipe Organ Builders & Conservators, and is the author of “The Pipe Organ: A Crash Course,” and “A King in Slumber: The Story of the Barley Memorial Organ.” Both are available at www.reynoldsorgans.com.